What is Axis’ vision for network-based audio? During 2014, Axis started to study the world of network audio technology and quickly came to the realisation that the field suited its Internet of Things (IoT) strategy for network-based security products. That is because network-based audio is the perfect addition to an existing security solution. Axis is always on the lookout for new opportunities and is confident that by developing network audio products, it has created a flexible and future-proofed solution that benefits both installers and end users. 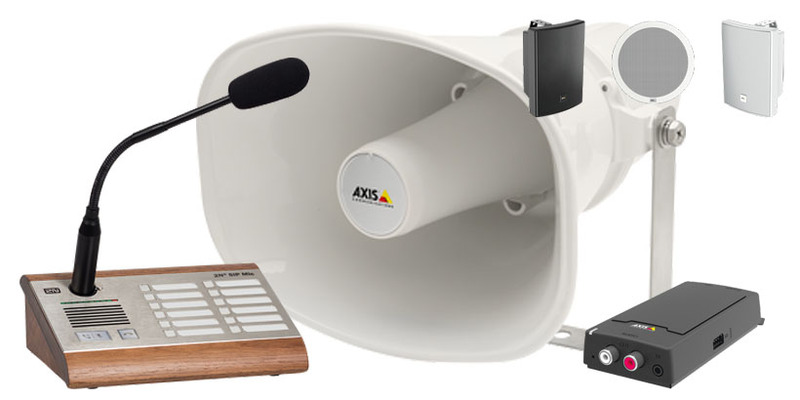 Not only is audio a perfect addition to a physical security system, but Axis has redefined the concept of network-based audio to include public announcement and background music capabilities. For customers that want to integrate security with other business functions, the addition of audio provides that added-value they are seeking. Innovation is in Axis’ nature. New developments are always on the horizon and Axis leads the way in the development of cutting-edge network security technology. IoT and network audio are no longer visions of the future. They exist today, and Axis is beginning to see real benefits. What is Axis’ audio offering? To illustrate the Axis audio technology offering, it is best to break it down into three distinct areas. Audio for security: A network-based audio system is the perfect addition to a video-based security installation. Perimeter protection is a great example of this. Imagine if a potential intruder climbs a fence; the camera alerts a security guard to deliver a warning to the intruder: ‘We can see you, you are trespassing’. More often than not this type of warning is sufficient, preventing the need for additional security measures. A public-address system: In certain environments, including schools, retail stores, hotels and public buildings, there is a need for informative messages and updates to be broadcast. This may be as simple as calling a member of staff to a specific area, such as ‘Staff to checkout 2’. Never has this been as easy as it is with network audio technology. Furthermore, messages can be automated when used in conjunction with queue management software. Background music: Audio technology from Axis can support retail stores and hotels with a need for background music. With pre-set volume and music choices, the solution allows for central and remote control, meaning better management of background music. The music can be combined with scheduled and live announcements, further helping to enhance the customer experience. Research has shown that productivity, mood and behaviour are positively influenced by music; something that can be actively exploited in retail and manufacturing environments. What are the advantages of network-based audio technology? The Axis audio solution is a complete all-in-one system. No additional hardware is required, meaning a smooth installation process with minimal storage space needed. Fewer components also mean lower costs. The system has no controls, which is a great benefit to a system’s maintenance as fewer mistakes can be made. System management and fault search are both easier to control. Each speaker can be directly integrated within an existing data network. This can then be managed remotely via a PC or laptop. Products can be added and removed easily and effectively. PoE means only one cable is needed per product to supply power to the unit and transmit sound and data. Axis strives to make innovative technology simple and accessible. If an engineer can install a network camera, they can also install an audio system. It is easy to add and remove speakers as configuration takes place centrally. A network-based audio system can also be integrated with other network products. For example, door control coupled with a network camera and speaker creates a complete security solution for passage monitoring. The Axis audio products support applications which can be loaded into the devices via the ACAP platform. One example is sound analysis which can detect abnormal sound levels, such as a scream or gun shot. In this scenario, the audio system can generate an alert, which provides security teams with information about abnormal activities that may require further investigation.